Lawyers are often concerned about how long it takes to successfully start using automation at their firm. Lawyers are so busy with everything else that implementing intelligent automation at their firm seems too ‘hard basket’. As a result, some firms that have really good use cases for automation are putting it off. The trouble with this is that their competitors down the road are already using it to gain efficiency and get a competitive edge. Get your own lawyer bot built: this option takes less than two weeks - all you need to do is provide the advice, contract or document you want automated. Use someone else’s lawyer bot: this option can take less than a day - all you need to do is try out the lawyer bots available and say which ones you want to use. We recently partnered with Brisbane Family Law Centre to build them two lawyer bots - one for a Parenting Plan and one for a Settlement Strategy. Both of these lawyer bots were built and delivered to Brisbane Family Law Centre within 2 weeks. After the bots were built, we worked with Brisbane Family Law Centre to make sure they were happy with the bots, quickly making any changes they needed. We received feedback from the Brisbane Family Law Centre team that this process was seamless. Now, Brisbane Family Law Centre is using the beautiful, easy-to-use automation tool to build their own lawyer bots. Keen to see it for yourself? 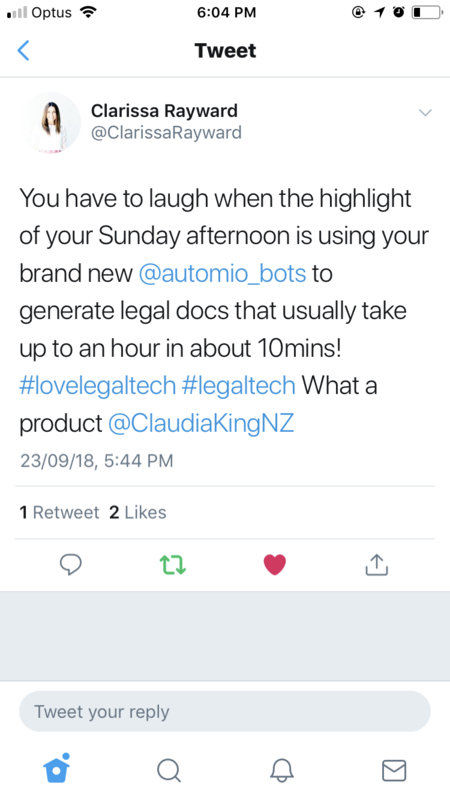 We’d love to show you our intelligent bot platform and how it can help you make your law firm more efficient, so you can save time, impress clients and earn more. Book an online 20 minute demo with our friendly team here. To find out 5 easy ways to automate your repetitive legal work, download the free guide The Law Firm Automation Playbook. You’ll discover how to use automation to reduce stress, impress your clients, and make your law firm more efficient and innovative.